I have to admit, I get let down and frustrated sometimes by the incessant mashing-up of 80s properties by artists, designers and toy makers. Most of the time this approach comes across as lazy, but sometimes, a nod, a wink, a tribute or an homage to a nostalgic toy property like G. I. Joe, Masters of the Universe (MOTU), M.U.S.C.L.E. or whatever actually works. I think I’ve found one of those rare cases. 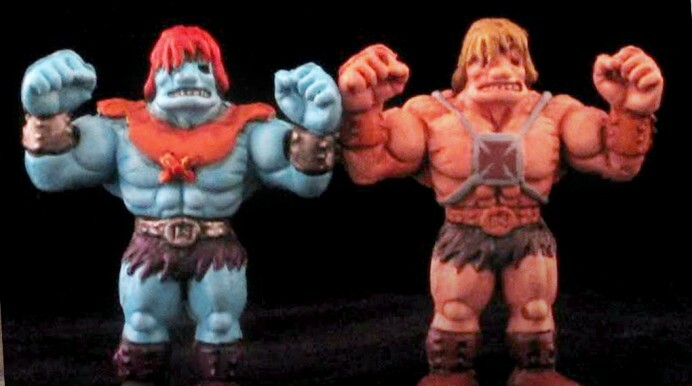 Behold – some of the most charming M.U.S.C.L.E. customs I’ve ever seen. Sure, they aren’t “original.” They are painted to resemble He-Man characters, but that is in fact the beauty of this project. Rick has taken minifigures we’ve all seen a million times over the past 20 years and selectively chosen them to be the basis for quick customization… reinterpreting them as other characters we know and love. Great. These custom figures actually feel like some kind of alternate universe or “bizarro” interpretation of the MOTU license… like these are odd foreign versions or something. Anyway, I just needed to share these, because they seemed to be an exception to the rule of the uninspired, 80s nostalgia mash-up. Am I wrong? Exactly! That’d be awesome. I love the Rorschach test reference. These are really incredible. As you said, I’m not a big fan of the mash-up mentality, because I feel like a lot of times they’re done without any real thought put into them. 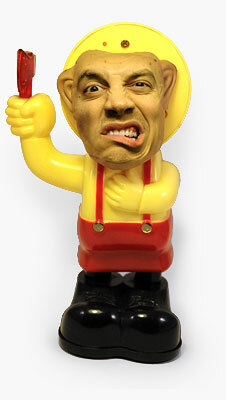 But this isn’t just slapping a Pikachu tail on a Mario and calling it PokeMario Bros or something. This took a lot of time, effort, and appreciation for both franchises. Now if only Mattell would get on these. 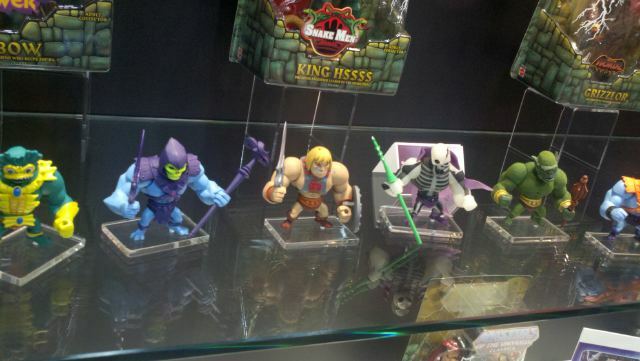 I’d love to have a little Trap Jaw sitting on my desk. Yay! Finally someone else who doesn’t instantly love something because it’s recognizable licenses combined. I was afraid I was the only one. 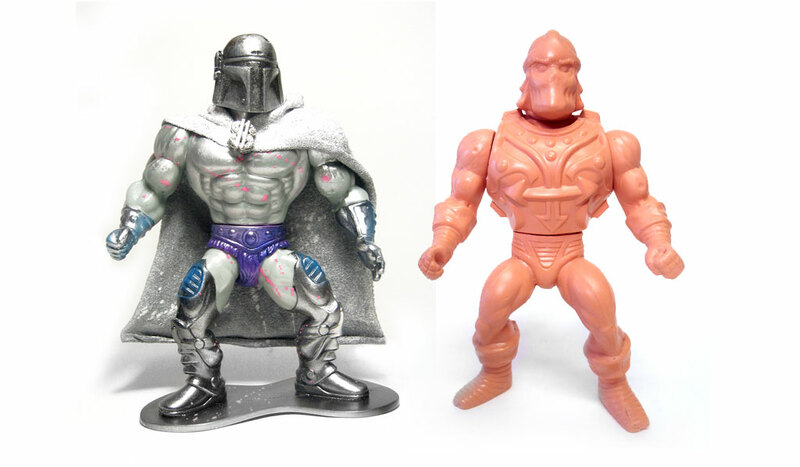 Also, I think Mattel actually already made some mini MOTUs… they just aren’t as cool as these customs. Rick did a good job on these 80s M.U.S.C.L.E. figures from Japan. Looks like he did some TMNT stuff too. Check out his galley page. Nice Job! So.. correct me if I’m wrong… Rick Dries took toys with regular statures and turned them into… well.. beasts? haha pretty cool if you ask me! These are indeed nice, although I think where you are wrong is in saying custom mash ups are boring and uninspired. I came to this page to see this custom work and I found the writing to be boring and uninspired.